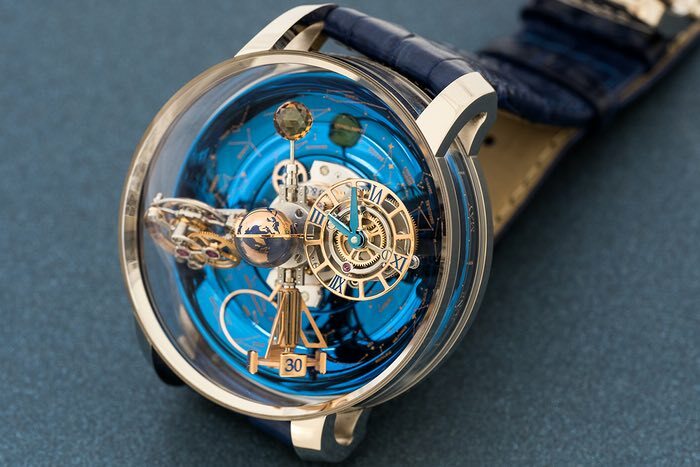 The Astronomia family of tourbillons are Jacob & Co’s own unique take on creating an astronomical complication. Typically, they’re not intended to be highly accurate representations of actual astronomical cycles (the most sophisticated example of a watch that does that is, right now, probably Vacheron Constantin’s Celestia). Rather, they’re a kind of kinetic sculpture for the wrist, being based around a four-armed carrier system that supports a variety of additional displays or representations of heavenly objects. The Astronomia watches also feature very thick cases with high-domed crystals, which emphasizes the three-dimensionality of the carrier structure (as well as providing a real vault-of-the-heavens visual effect). Although we’ve said that in general, accurate celestial cycles aren’t what Jacob & Co. is after in these watches, in the case of the Astronomia Sky, there is a very precise indication of sidereal time, as well as of the stars overhead. The entire carrier system rotates around the dial once every 20 minutes. At the end of each arm there are, moving clockwise, the dial showing the time; a sort of stylized rocket-ship running seconds indicator, which rotates on its own axis once per minute; a double axis tourbillon (which with the addition of the central point of rotation for the carrier system, is actually a triple axis tourbillon) and a rotating globe cut from an orange sapphire. The dial showing the time is fixed to a differential system so that it’s always right side up, no matter the position of the carrier on which it’s mounted. 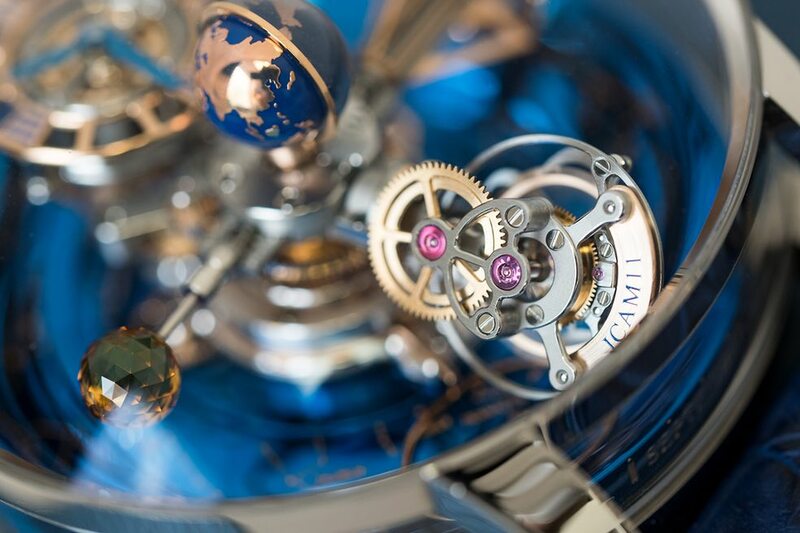 Just behind it, you can see the central globe, which rotates inside a hemisphere of tinted sapphire (the globe is hand-engraved titanium and turns once every 24 hours). The tourbillon watch rotates around its innermost axis once every 60 seconds, and around its outer axis once every five minutes (and of course, circles the inside of the watch three times an hour). The original Astronomia had a spherically faceted diamond, where here, in the Sky, you see an orange sapphire. The idea for the diamond was that it was a stylized representation of the Moon; the orange sapphire dispenses with that resemblance, but you can, since its period of rotation isn’t intended to simulate any particular heavenly body, pretend it is the orange planet or star of your choice (I’d go for Mars, myself…it seems to go with the rocket ship on the opposite carrier). The stone has 288 facets and the cut, which was developed specifically for the gems used in the Astronomia, is actually patented. Since the central carrier rotates once every 20 minutes, the watch looks different every time you look at it, and if it’s on your wrist, you’re probably going to be looking at it a lot.